Jo has been my/our realtor for 10+ years. Her experience and knowledge as well as her attention to detail and responsiveness are like none I have experienced before. I work with Jo in all of my real estate endeavors and recommend her to anyone that wants a personal touch and dedication. Thanks Always Jo! Jo was an amazing help throughout the process of buying our new home. She has the experience & great knowledge that helped us pick the right house for us. She was always there to help answer any questions we had. I will definitely recommend her to family & friends. Thanks Jo for everything. Jo helped us in countless ways. I highly recommend her for any of your real estate needs. This is the 2nd house she has sold for us and also did a purchase of a property as well. We were blessed to have her help us through the entire process! She is an expert in the Tallyn’s Reach market. From pricing to staging and showing, she was there for us. We would recommend Jo Pellegrino to anyone thinking of buying or selling a home. After talking with a couple of realtors, we knew Jo would be the right one to sell our house quickly in order to meet the terms of our financing agreement with a new builder. We negotiated an offer to sell within three weeks, at just under our asking price. Jo was able to suggest temporary living arrangements while the new house was being built. She assisted us in contracting for the new build, and fielded questions and problems that arose along the way, and worked with the builder for solutions. We never hesitated to all her when we needed advice, and she never hesitated to assist. A few issues arose after closing the new home, with which she was more than willing to help us resolve. Jo is a committed, experienced and knowledgeable agent, and we knew she was working 100% for our best interests, both in selling and buying. Jo is a professional who lives in the neighborhood and has a very in-depth knowledge of the different builders and the value of the homes they build. We were really pleased with the marketing campaign and the advice we were given on how to prep and present our home for showings. Even though we put our home on the market a little later in the season, we had numerous showings which resulted in the sale of our home. professionalism you put into your relationship with is throughout the sales process. 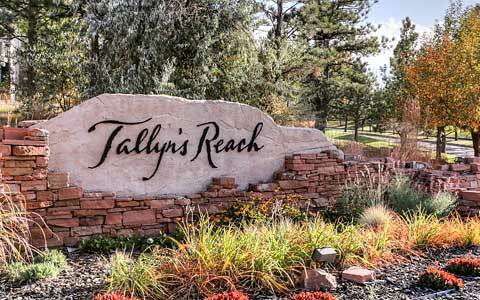 We wanted to share our experience with anyone selling or buying a home in Tallyn’s Reach, so they have the opportunity to receive the same great service we did. Jo is dedicated, professional and knowledgeable. She was very thorough in helping us stage our house, making sure everything was in order before it was listed and followed-up with us after each potential buyer visit. She provided honest feedback on the local market and what was currently listed and selling in the subdivision. She actually lives in Tallyn’s Reach and over 10-years we lived in this great community. Jo has been very involved in the community and served on various committees. She is proud and truly committed to the neighborhood. If you want someone that knows the community, the market trends and keeps you well- informed, get Jo on your team. Our overall house selling experience was a pleasant event, thanks to Jo. The upfront real-estate education we received from her prepared us for the whole process. When the first sale fell through after the buyer lost his job, we had no doubt about a quick resale, based on Jo’s efforts and spot-on appraisal. The feedback from all the viewings just kept reinforcing our trust in her judgement, expertise and experience. I have already started recommending her to everyone at work in need of a realtor. I would like to express my greatest thanks and appreciation to you, Jo Pellegrino and to the entire staff at Re/Max Professionals. Georgina and I thank you for your high level of Professionalism, for the warmth, your dedication, attention and devotion that you and your staff displayed to Georgina and I during the sale of our home. It did not matter to you that we were in California during the entire time that our home was on the market. You spoke to us several times weekly; either by telephone or by email. You kept us well informed and you were an excellent listener. You hear your clients and respond quickly and honestly. Jo Pellegrino, we have sold five homes and purchased six homes over the past 30 years. During that time we never had the pleasure of working with any professional real estate agent of your caliber. You are the best. You worked with us to sell our home that we resided in for twelve years. You gave us excellent advice on preparing our home for sale and you always looked out for our best interests. Georgina and I felt confident that you worked hard for the best possible outcome. We are extremely satisfied with results; as well as the timing of our sale. Your professionalism, experience, kindness and honesty coupled with your diligence and hard work just made this a wonderful experience. We will stay in touch. We thank you very much for your time and your effort. Absolutely unique and excellent real estate professional. Makes your search and finding of the property, negotiating, entering into contract and closing transaction nice and very smooth and effective. Very time efficient approach especially good if you do not have a lot of time to dedicate to finding and then purchasing your home or real estate investment. Knowledge of local market is amazing! Process knowledge is such masterful that I would suggest writing a book on this topic. You can get a hold on this professional without any delay and almost immediately. As to her negotiation skills, I can assure you, she can author another book on this topic. The best possible real estate professional you can dream of when buying or selling your property. My wife and I had the pleasure of having Jo Pellegrino represent us when we sold our house in Tallyn’s Reach. Jo> is the perfect Real Estate Agent who used a network of resources to help us sell our house. Jo guided through the entire process of selling our home: Jo helped to stage our house (she even provided many decorative items for our house), hired a great photographer, and offered many suggestions to make our house more marketable. Jo is also a great communicator, and she was available almost every time we called her and if we left a message, she was quick to return our call. Jo kept in touch with the selling agents who toured our house and provided great feedback to help us sell our house. Jo recommended using a site plan to show a fence line for a new fence and that proved to be the tipping point that sold our house. My wife and I wish we could use Jo in the search for our new home after we moved out of the state. If we do move back to Colorado, Jo will be the first person we call to help find a new home. Jo is more than a great Real Estate Agent, she is a caring person who maintains contact after the sale and likes to stay in touch. I was very lucky to find Jo to help me market and sell my property. When you trust her, she is able to consistently apply her years of experience (in all aspects of residential real estate) to the professional sale of your property. I was quickly able to realize that Jo has expertise in a large number of areas, and that I could have complete faith in her ability to handle this job with the utmost level of professionalism and expertise. She understands the market, and the process of getting the market to quickly appreciate your property, despite any blemishes that it may have. She understands the need to “put the word out”, and be ready for maximizing your property’s “dayview” on the market. I found Jo’s efforts to help me value my house were quite professional. She had a clear basis for her conclusions in this regard, and worked her best to maximize my value both in the listing and the sale, of the property. Jo’s many years of working as a broker are quite evident in all aspects of her communications with all the parties that are involved in these types of transactions. In my case, we were able to go from listing to closing in 17 days. A truly spectacular result. I attribute this to many of the skills that she is able to demonstrate on a constant basis. She is tireless and timely in her ability to communicate and remain accessible to the various (and many) parties. Her professionalism in considering your overall position, and advising you of your options, are exactly what is needed in helping a seller to assess when to “fertilize”, when to wait, when to “prune”, and when to “harvest”. Your best use of Jo comes with trusting her judgement, and letting her skills engage in the professional sale of your property. Remain immediately accessible, trust her judgement, and it is very likely that you will be very happy with the result. My husband, Rob, recommended Jo to me after he had a fantastic experience with her while buying his first home in Colorado. I was interested in selling my condominium, which I had been renting out for over a year. Jo was so willing to help me get the condo prepared for selling. Her guidance and advice was invaluable; she even hooked me up with a contractor to replace a portion of carpeting that had been ruined by my tenant. It was so reassuring to know that Jo had all of the bases covered in the selling process. She went ‘above and beyond’ to help me stage the unit, and her photographer did a tremendous job of documenting all the hard work that was done to prep for sale. Rob and I both highly recommend Jo Pellegrino. Her professionalism, caring, and experience made the process of selling my home a breeze. I look forward to having her help us find a larger home in a couple of years. It is my pleasure to write this letter on behalf of Jo Pellegrino. I have known Jo for almost 25 years. I have always respected her integrity on both the personal and professional level, and when it came time to sell our home there was no question as to who we would call. Jo gave us great advice on what we needed to do to get our home of 24 years to sell. All her advice worked, as it sold in one day! In addition, my husband and I were on vacation in China when the offer came through. Jo was great in dealing with the 14 hour time difference and sketchy internet connection, and she got us the offer and contract we wanted. We also had Jo help us find our new home. We decided to build a brand new construction, and she was with us from groundbreaking to finish. She showed up at all the meetings we had with the builder, and her expertise pointed out discrepancies in the paperwork that we might have overlooked. Moving can be very stressful, especially when you haven’t moved in 24 years! Jo did everything to help make the move from our old home and our transition to our new home go very smoothly. I would highly recommend Jo Pellegrino-Ellis to anyone looking for caring, professional realtor. She’s the best! I have known Jo since she sold me my house in Castle Rock, back in 1997. When I returned to the Denver Area, I had no doubt in my mind that I would use her as my Realtor. And now that I am leaving Colorado once again, I am proud to be doing business with her again as she is listing my house to sell. I have been a Realtor and as such I have seen all kinds of Realtors. Jo is a hardworking, committed, professional Realtor, working hard to protect her client’s interests and ensure that the road to home purchase or sale is as smooth as it can be. She even helped me when I was selling my house in another state prior to coming her, giving me home staging information that proved invaluable. I credit that advice with the sale of my house, at top dollar, in 8 days, while other houses were languishing on the market for months. She has also had the opportunity to provide me with referrals of service providers to get my house ready to sell. The providers she has referred me to have been top shelf businesses that provide excellent customer service. Needless to say, I would commend to your serious consideration using Jo Pellegrino as YOUR agent. She will provide you with outstanding service, excellent knowledge all based on years of experience and training in the real estate market of Denver. If you don’t have Jo in your corner you could be making a costly mistake! !